I have a project for my graduate degree. It's about Monitoring Temperature and Humidity using Message Queuing Telemetry Transport on Serial NodeJS. To get sensor data to Wemos D1 Mini and NodeJS had done, also on my MQTT had done. My lecturer wants to get data from two sensors at the edges of the room, he suggests using a 74HC138. I'm using this 74HC138 Datasheet and I'm using this BME280 Library. Serial output always says Unable to find BME280. Waiting 3 seconds. I know it's because CS pin cannot detect. I think something is missing my code. Thanks to my pal @Majenko, I'm out of the 74HC138 stock but i have 74HC139, i think that's same to me, i tried advice from @Majenko early morning after i make assembly of my board own for define Chip Select Wemos to my enable pin and get back my missing code whom not understand me. See below for verbose log of uploading my sketch. See below for serial monitor. Using a 74HC138 in this situation is both pointless and wasteful. You're using 3 pins (or 4 - see below) to drive a chip to select between 2 pins. That's wasting one more pin than you would by directly driving the CS pins. The only time it would make sense would be if you were wanting to connect with 5 or more devices, in which case you would get a saving in the number of pins used. Anyway - what you are missing from your code is absolutely everything to do with the 74HC138. First off, you're using a library which assumes the CS pins are directly connected to the MCU. Second, there is no code to set the A/B/C pins to the right state to select an output. Use the same CS pin in your code for every BMS280 instance. 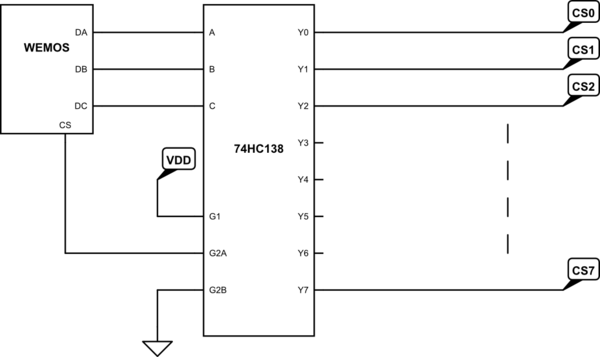 The CS pin you passed to the BME280 instances will control the state of the currently selected output on the 74HC138, turning it into a demultiplexer controlled by the A/B/C pins. Using multiple instances of the BME280 class associated with each selected output will allow proper tracking of any internal state and data associated with the device connected to that output. 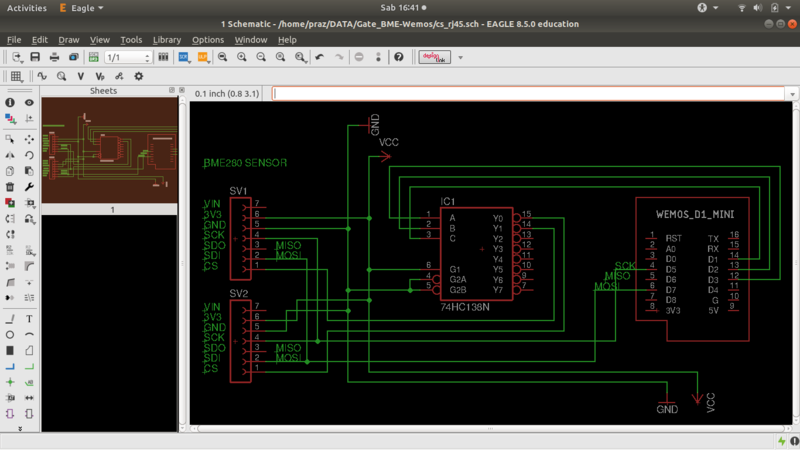 Or, and this is just throwing ideas out there, don't use the 74HC138 and tell your "lecturer" that it's a stupid idea to use 3 pins (4 including the chip select pin) to control a pair of devices that need a total of 2 pins. Not the answer you're looking for? Browse other questions tagged esp8266 sensors temperature-sensor or ask your own question. How to create a simple TCP server with the analogRead value on Wemos D1 mini?